he Asian societies that began in modern-day China are among the oldest known human societies on earth. Though they were at least as developed and sophisticated as early civilizations in Mesopotamia (centered in present-day Iraq) and Egypt, these Asian societies have received far less study and attention in the West. In the last century, however, with the modernization of the ancient nations of China and Japan, people in the West have come to know a great deal about early Asian cultures. Many who learn about these ancient cultures have developed a great respect for Asian accomplishments in technology, governance, and the arts, and also gain an understanding of the distinct costume traditions. To appreciate the distinct costume traditions developed in ancient China and Japan, it is first important to understand how these civilizations developed over time. 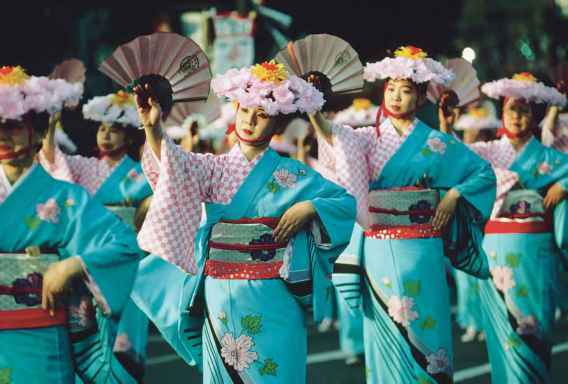 Japanese women march in a parade, wearing blue kimonos and holding traditional Asian fans. Reproduced by permission of © Michael S. Yamashita/CORBIS. societies along the banks of the Yellow River in modern-day China. 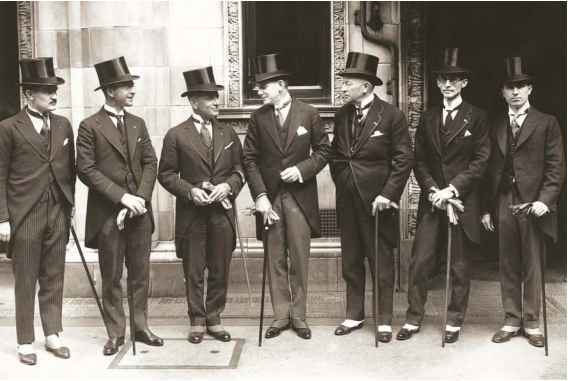 Over the years these societies became more sophisticated, developing technologies and early forms of government. In about 1875 b.c.e. a powerful empire known as Xia began the first Chinese dynasty, the name for a long period of rule by several generations of a family. Our detailed knowledge of Chinese history begins with the dynasty that followed: the Shang dynasty (c. 1550—c. 1050 b.c.e.). It was with this dynasty that people began to keep written records of Chinese history. Ancient Chinese society was divided by classes. The emperor, who was believed to have descended from the gods, was at the top of society. He, or sometimes she, was surrounded by wealthy kings, warriors, and priests. Most of the other people were farmers and were fairly poor. As is true with most ancient societies, almost all of what we know about culture and dress comes from the wealthy classes. Though China began as a small empire centered on the Great Bend of the Yellow River, it expanded over time to become quite a vast kingdom. As the empire expanded, kings of local areas gained more power, and they sometimes fought among themselves. In about 1050 b.c.e. the Zhou king defeated the Shang emperor and started a new dynasty, the Zhou dynasty, which lasted until 256 b.c.e. Under the Zhou, the empire expanded even more and the Chinese came into conflict with other non-Chinese peoples who they called "barbarians." (Similarly, the ancient Romans also called those people who lived outside their borders barbarians.) The Chinese felt that their culture and clothing was far superior to that of barbarians. The Great Wall of China, a massive stone wall that stretches for nearly 4,500 miles across China, started being built in 221 b.c.e. in order to keep barbarians out of China and was completed nearly one thousand years later. Though dynasties changed over the thousands of years of Chinese history, many of the elements of Chinese life remained the same. The Chinese had a deep respect for tradition, and this respect meant that many of the elements of culture endured throughout history. Respect for elders, the religion of Buddhism, and certain clothing customs lasted for many years. Also enduring was the rule by emperors, aided by a vast bureaucracy that saw that the emperor's will was followed. Samurai (SAM-er-eye) were Japanese warriors who were revered for their skills as warriors, but also for their distinct influence on Japanese fashion. Samurai first appeared in Japan as early as the eighth century C.E., but they truly rose to power in the eleventh century as elite warriors in service to their feudal lords, or daimyos. Other samurai served as guards of the imperial palace. The samurai were accorded special status after about 1600. They alone had the privilege of wearing two swords, they married only among their own class, and they passed their privileges on to their children. The word samurai literally means "to be on one's guard." 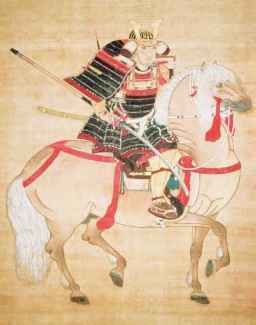 The samurai, or warrior class, replaced the court nobles who had once surrounded the ruler. These nobles had always worn ceremonial clothing and lived a very formal existence within large castles. The rulers understood that the samurai were strong and wise and capable of forming their own armies and taking control of the country. To keep the power of the samurai in check, the rulers encouraged the samurai to live by elaborate rules about dress and behavior. Samurai lived by a code of honor known as Bushido, the way of the sword. Loyalty, truthfulness, sincerity, and readi ness to die for honor were its main attributes. The samurai also became very dedicated to ceremony and to acquiring and displaying meaningful colors, fabrics, and styles. Among the fashions that were developed by samurai in the fourteenth and fifteenth centuries, the hakama, or trouser, and kataginu, a ceremonial ensemble with winged shoulders, are the most distinctive. In recent times, samurai fashions all property and wealth are shared equally by the people.) Chairman Mao, as he was known, brought dramatic changes in Chinese life and again closed his country to the West. He also changed Chinese clothing styles dramatically in an effort to make everyone dress the same. Today, China is still a Communist country, but it is slowly opening to Western influence and fashion. Japan is an island nation that lies to the northeast of China. Though there is evidence of human habitation in Japan dating back thousands of years, it was not until settlers from China and Korea traveled to Japan in the sixth century c.e. that a definable society have been well represented in Japanese theater, such as No plays and Kabuki, and in film, particularly the historical films of director Akira Kurosawa (1910-1998). (A No, or Noh, play is a classic Japanese dance-drama having a heroic theme, a chorus, and highly stylized action, costuming, and scenery.) The samurai film, in fact, has had a wide influence throughout the world. Akira Kurosawa's legendary movie, The Seven Samurai (1954), was the inspiration for the light saber battles in the film Star Wars (1977) and its sequels. Samurai suits of armor, made of ceramic plates sewn together, were the inspiration for the military flak jacket developed by the United States Army during World War II (1939-45). Samurai wore distinctive top-knot hairstyles and wore bold crests on their robes. A samurai warrior wearing samurai armor and a horned helmet. Reproduced by permission of © Sakamoto Photo Research Laboratory/CORBIS. took root. Early Japanese society was deeply rooted in Chinese customs and traditions of religion, governance, and costume. The Heian period, which lasted from 794 to 1185 c.e., was the first flowering of a unique Japanese society. The Japanese began to develop distinct clothing traditions that were more formalized and ritualized than those in China. Following the collapse of the Heian period in 1185 c.e., a number of powerful kings vied for power. Each king surrounded himself with warriors known as samurai. The samurai had a distinct warrior culture of their own, with rules of behavior and dress. The culture had a great influence on fashion in Japan. The most powerful samurai was known as the shogun, and he ruled with the power of an emperor. In 1637 the Tokugawa shogunate (the name for the government of the shogun), which had assumed power in Japan, closed the country to any exposure to the West. For nearly two hundred years Japan resisted Western influences. It retained its traditional culture, while the world around changed. Eventually powerful British and American governments forced Japan to open to trade. In 1867 the rule of shoguns ended and an emperor was restored. The emperor, Meiji, believed that Japan must become a modern nation. He allowed the Japanese people to vote, and he developed a modern economy. Japan became a powerful nation, so powerful, in fact, that it opposed the United States and its European allies in World War II (1939-45). Though Japan lost the war, it remains a powerful industrial nation to this day. Late in the nineteenth century the Japanese people adopted Western dress. Their traditional dress, which dates back to the earliest years of Japanese civilization, is still worn, however, as a way of showing respect and love for ancient traditions. Traditional Japanese dress is reserved primarily for special occasions and ceremonies. Some fear that by the end of the twenty-first century traditional Japanese dress will disappear altogether. China and Japan are not the only Asian nations with deep roots in the past. Korea, Thailand, Vietnam, and many other Asian nations also claim cultural and costume traditions with ancient roots. Cobb, Jodi. Geisha: The Life, the Voices, the Art. New York: Knopf, 1995. Dalby, Liza Crihfield. Geisha. Berkeley, CA: University of California Press, 1983. Downer, Lesley. Women of the Pleasure Quarters: The Secret History of the Geisha. New York: Broadway Books, 2001. Ferroa, Peggy Grace. China. New York: Marshall Cavendish, 1996. Golden, Arthur S. Memoirs of a Geisha. New York: Knopf, 1997. Heinrichs, Ann. Japan. Danbury, CT: Children's Press, 1998. McLenighan, Valjean. China: A History to 1949. Chicago, IL: Children's Press, 1983. Shelley, Rex. Japan. New York: Marshall Cavendish, 2002.